WinAir Version 7 is the aviation industry’s top aviation maintenance and inventory control software solution. 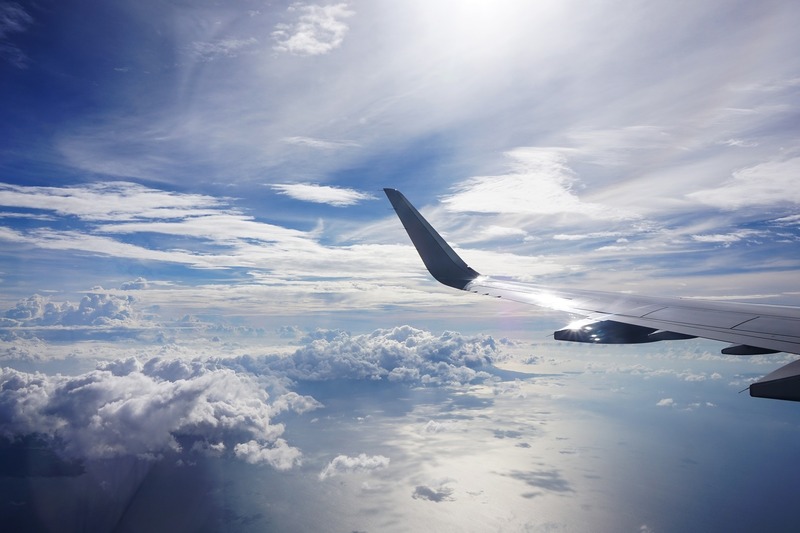 Since the release of the original WinAir solution 30 years ago, WinAir has received compliments from its users, members of the media, and the aviation industry at large. All of which have commented on the software’s ability to streamline and expedite processes. This has saved significant capital for WinAir clients and has allowed them to focus their efforts on their day-to-day business practices. In order to clearly define the immediate business benefits of WinAir Version 7, we’ve taken the observations and assessments from our clientele and have produced a list that highlights the top 10 benefits of the software. For your reference, a downloadable summary of this material is accessible at the bottom of the page. One powerful theme that underscores this entire document is the fact that with WinAir Version 7, aviation operations save time and accelerate procedures throughout all levels of their organization—from the hangar to the stores room, and all the way up to finance, the records department, and beyond. This is a result of the software’s ability to automate and simplify processes. In terms of compliance and reporting, WinAir has received unanimous praise from business owners at a variety of fixed-wing, rotary-wing, and mixed fleet operations, who have asserted that they feel confident in the accuracy of data presented in WinAir Version 7. This newfound clarity is due in part to WinAir Version 7’s enforcement of data integrity through validation and sequential workflow. With WinAir Version 7, you can say goodbye to duplicate data entry and consider it a thing of the past—the software has been designed to limit the number of times that data must be entered into the system, so you will no longer have to input the same data on multiple occasions. Similarly, and thanks to the WinAir team’s comprehensive understanding of the aviation industry and aviation maintenance best practices, a significant number of processes that are manually administer in other aviation maintenance solutions, are minimized and streamlined in WinAir Version 7 through process automation. Whether you’re attempting to access WinAir Version 7 via your office computer, your mobile device, or simply any other internet connected device, we’ve got you covered! WinAir Version 7 was developed to be accessible anywhere in the world, and at any given moment. 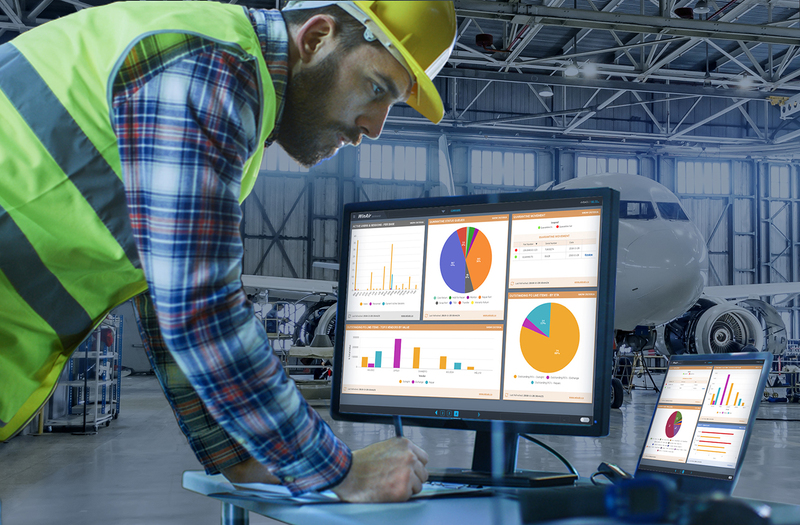 So you can rest assured knowing that no matter where your team is operating, regardless what device they are utilizing, they can login to WinAir Version 7 to perform their maintenance activities. To safeguard against the loss of your ever important data, WinAir Version 7 was built using data loss prevention functionality. This functionality ensures that sensitive company information is kept within the corporate network by controlling what data end-users can transfer. It also detects any data breaches and prevents third parties from reaching your data. No matter the size of your fleet, WinAir Version 7 is capable of managing the maintenance activities on your aircraft. In addition, the software is a fully scalable solution, meaning that WinAir Version 7 will accommodate organizational growth. While other aviation management software platforms place a cap on the total number of aircraft managed by the solution, WinAir Version 7 was designed to grow with your organization and allow for the expansion of your business. At WinAir, we have a thorough understanding of how aviation operations manage their parts workflow. 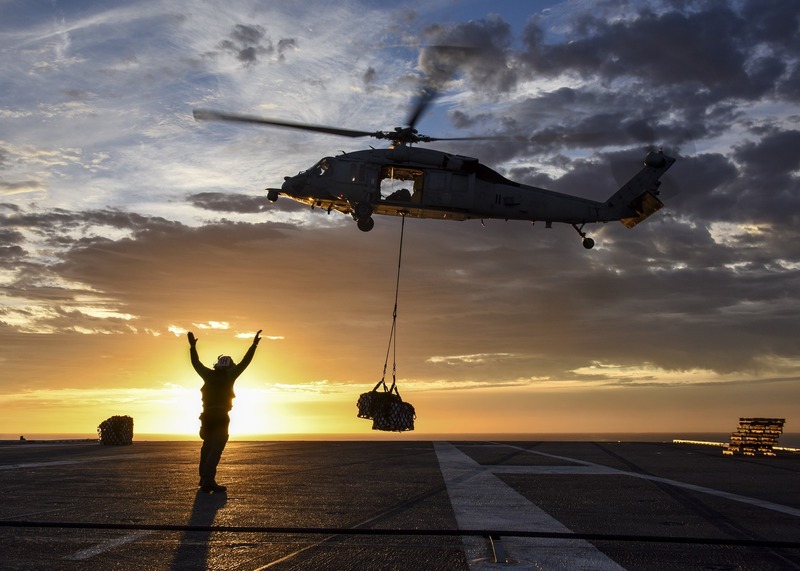 We know that in order to make informed business decisions, aviation operations require complete transparency and instant access to the information that they require. For instance, if your Maintenance Planner is outlining maintenance activities for the week, they shouldn’t have to call your Store Manager every time they require an issued part. Similarly, that same Maintenance Planner shouldn’t have to email your Procurement Manager to request that they order new parts, when you are in need of restocking. Rather, this information should be processed immediately via system notifications, which is exactly what happens in WinAir Version 7—automated notifications for required parts are sent to the appropriate parties based on the scheduling of actual maintenance events. So when your Maintenance Planner schedules maintenance activities, the actual act of scheduling those events in WinAir will automatically relay required parts notifications to the correct individuals at your organization. 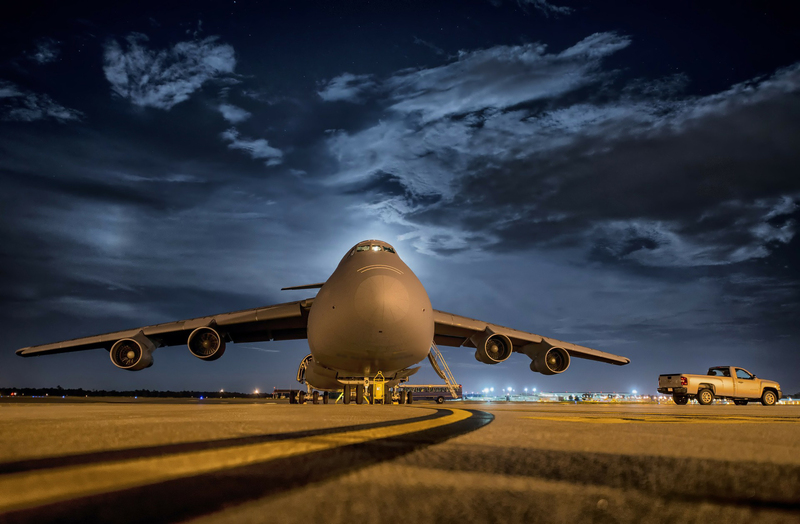 This use of advanced logistics saves aviation operations valuable time, which can now be expended on performing the actual physical maintenance activities on aircraft. By automating administrative processes and limiting the number of manual activities within the system, WinAir Version 7 is able to effectively increase workflow efficiency at aviation operations. Since there are less manual inputs associated with the software, the likelihood of errors is decreased. This reduction in human errors and minimization of manual inputs, coupled with an increase in automated processes, saves maintenance operations time and money. In addition, the act of automating administrative processes assists with improving inter-departmental communications as the information that is relayed by the software to the appropriate parties is sent instantly and is void of errors. At WinAir, we understand the particular work steps that aviation maintenance technicians must follow in order to successfully complete a series of tasks. After all, the original WinAir product that was released in the 1980s was based on an idea that was conceived by an Aircraft Maintenance Engineer (AME). That AME, who also happens to be one of WinAir’s founders, wanted to create a product that would streamline aviation maintenance processes from the hangar floor up. He knew exactly where maintenance processes could be improved upon through the use of technology, so he went on to establish WinAir, the software solution that would revolutionize the aviation industry. Today, these aviation maintenance procedures have been perfected in WinAir Version 7, which effectively mimics actual aviation maintenance work steps. Being able to define your own automated processes is a key factor for improving and accelerating workflow. Aside from the obvious curtailment of manual inputs, automated user-defined processes assist operations with enhancing software navigation and improving the overall user experience. They also mean less data entry, which in the end, equates to less human errors. With WinAir Version 7, setting up automated user-defined processes is a simple task that saves organizations countless hours that were once devoted to manual processes. WinAir Version 7 does all this and more by providing aviation operations with instant access to the information that they require. For instance, if you are in need of a specific part that is not available at your location, you can easily identify whether it is accessible at another base, along with the total number of items that are currently in stock. This testimonial speaks volumes about the versatility, accessibility, and ease-of-use of the software solution. With WinAir Version 7, you don’t have to be within your internal network to access your data. Since the software is browser-based, all that you require is an internet connection and your device of choice. At WinAir, we know aviation maintenance. It’s been our passion for 30 years now. When we designed WinAir Version 7, we listened carefully to the specific requirements and recommendations of our users, so that we could develop a software solution that was truly user-driven. WinAir Version 7 is aviation maintenance software built for and designed by aviation maintenance professionals. It has proved to be instrumental in assisting countless aviation operations worldwide with streamlining how they do business. Would like to learn more about WinAir Version 7? 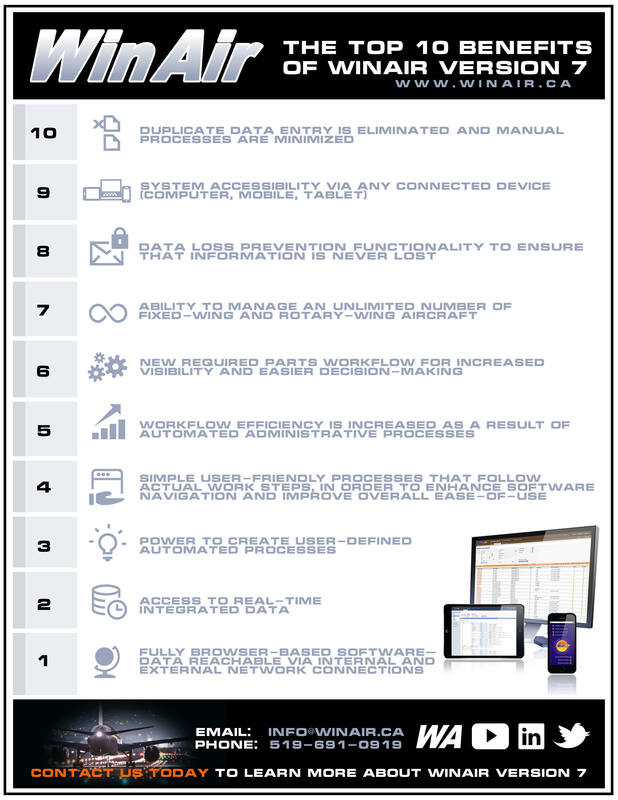 Download our Top 10 Benefits of WinAir Version 7 Summary Sheet and Contact us today to discuss scheduling a time for a custom WinAir Version 7 demonstration!